Yesterday afternoon, my wife and I were walking through Target when we came across something really cool…a Dodge Viper electric car. We are both car people, so we were completely floored. Right away we starting thinking about how cool it would be for D to have one while secretly thinking that we both really just wanted it ourselves. 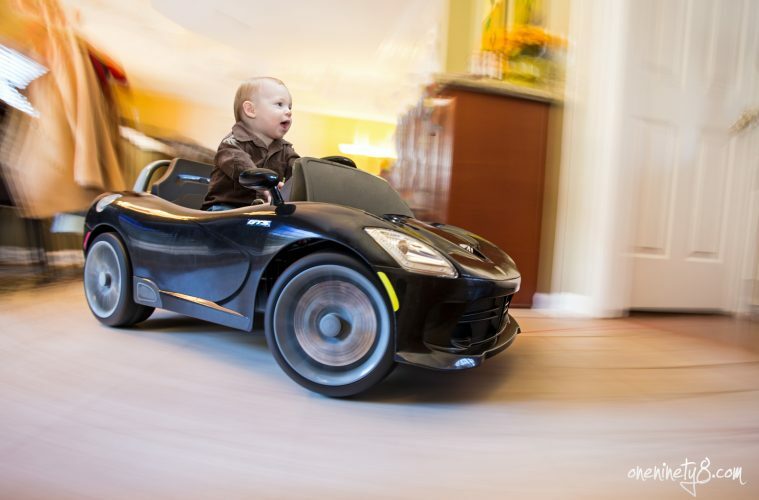 This was one of those moments that I believe we all go through as parents…an irrational buy just because we think it is cool. The reality is that D is too young for this thing anyway. It says it is for kids 3 years and up, so that makes it so that he can’t even reach the pedal when he sits in it. We didn’t care…it was on major sale so we had to get it. It was dumb but a lot of fun. Right away, all I could think about was doing a rig shot of the little car. I have done a lot of rig shots on high end cars so why not on a toy Viper?! 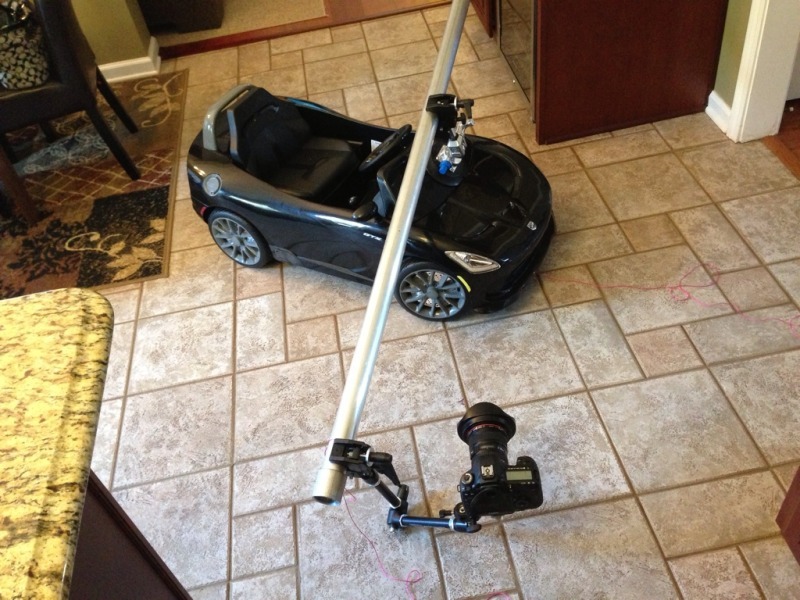 For those of you that don’t know, a rig shot is the process of suction cupping a large pole to the car…then you mount a camera to the end of the pole. With a long exposure (generally a couple of seconds), you roll the car and then Photoshop out the pole later. 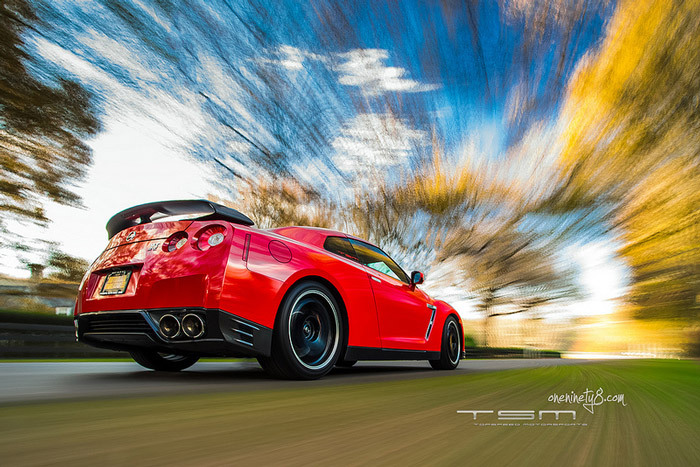 Here is an example of the final result with a Nissan GT-R. As you can see…it really gives the illusion of speed when in reality the car was only going a couple miles per hour. As soon as we got home, I went to work setting up the rig shot. This one wasn’t going to be easy. Not only is the car tiny, but the picture would have looked really funny without D sitting in it. I had to rig the car…then I had to take a picture of D sitting in the car to later blend the two together. Here is a picture of the rig setup on the car itself. Overall, it was too heaving for the little car so I had to have my wife pull the car with string while I held up the camera end with string as well. It was a complete circus. After Daniel got up from his nap, we threw him in the car and I shot a couple of quick pictures while my wife made funny faces at him. I got the shot I wanted and went to blending them together. The outcome is what you see below. I am incredibly happy with the result. It isn’t perfect by any stretch but it really captured what I wanted it to. When we first had Daniel, I tried to take a picture of him almost every day for my wife once she went back to work. After awhile, I started to notice that they all really looked the same other than whatever he was wearing and the face he was making that day. Lately, I have really been trying to think of unique ways to capture D’s life like I did with this rig shot. They take a lot more work and planning, but I think it will be something really cool to look back on someday that is different than him sitting at his high chair every morning. He is growing up so quickly so I think it is important to have fun moments like this to remember for a lifetime. Ever since we brought the Viper into the house, he has been getting in and out of it just playing with the car. He can’t drive it, but he already loves having it around. The rig picture was taken the first time he sat in it and it really shows how happy he was. I have been thinking a lot lately about how I need to enjoy being a dad as much as possible. While this was a rare case of spoiling for no reason at all (we are typically very conscious of not being like that…90% of his toys and clothes were actually bought at consignment sales), the experience of capturing the moment in a different way was really rewarding. Most of the experiences we make will not involve buying anything at all…even though in this case it did. 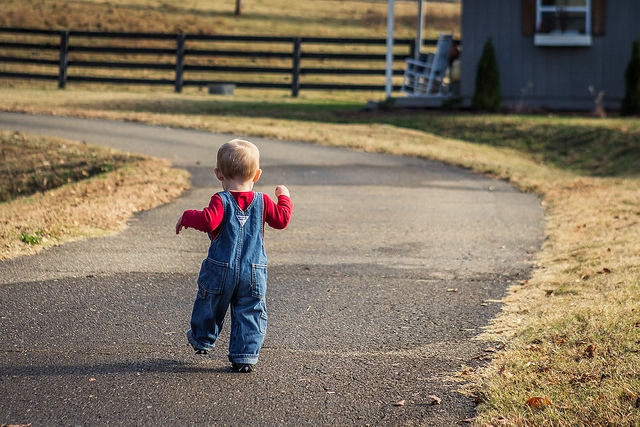 The challenge is going to be finding other ways to capture his early years through picture like this, but it will be a fun adventure with my son as we try. Cool shot and nice write up! This is awesome! I love the photo, but even more, I enjoyed learning about the process involved in producing it. Thanks for sharing. Thanks! I thought people might like to see how it was done. Amazing photo! I would love to see a high res version of it.